Futon is a typical Japanese way of bedding for the night. Nowadays, the stuffed mattress (shikibuton) and the blanket (kakebuton) are together called a "futon". The futon set can easily be stored away in a special oshiire alcove and the room used as a living room. The people during the Edo period, especially the poor, did not use bed covers as we have them nowadays. They only had a stuffed matress shikubuton 敷き布団 or some kind of woven mats to lie down on. Sometimes the bare planks of wooden floor would have to do, maybe covered with some straw. And they wore warm night clothes (yogi) to keep the cold out. Poor people, especially in the colder northern regions, slept near the fire and used anything to keep them warm, even dried seaweed was put into quilts (documented from Akita in 1789, for example). Hemp and straw and hulls were also used for quilts. Poor people even slept in straw bags, one couple in one bag. A poor family used to sleep close toghether to use the body heat for warmth. Since kana mugura カナムグラ（鉄葎） Humulus japonicus is of the hemp family, it might well have been used for stuffing a quilt of the poor. senbei futon 煎餅布団 "rice cracker matress"
and had only little cotton stuffing. In Edo, futon usually ment the matress, whereas in Osaka (Kamigata)they began to use kakebuton quilted blanket covers a lot earlier.
. Hattori Ransetsu 服部嵐雪 1654-1707 . Thin blankets like a towel, that easily soak off the sweat from the sleeper. The summer is quite hot and humid in Japan and difficult to sleep, even now with air conditioning. The wife of his disciple Rika 李下, who was also one of his haiku students, had died in the autumn of this year. This hokku is in her memory. How lonely poor Rika must feel now on this cold night without his beloved wife. and another YA in the middle of line 3. Here the cut markers carry the feeling of "stress and continue". sugoki, sugoi 凄い,　which is a rather strong emotion. Rika 李下 is famous for helping Basho plant the bananas (bashoo) at the Fukagawa hermitage. Perhaps here YA can be read as the abrupt form of the plain copula rather than the end-stopping exclamatory. minobuton 三幅蒲団 - A small futon matress with a width of three NO 幅. This small matress is an expression of his poor living conditions. lit. I wrap my body in a matress of three NO width. Three NO of width was the smallest for a futon matress. The cover futon was wider, about 4 NO or 5 NO. one NO 幅 of cloth is about 36 cm wide. Written in 1688 貞亨5年, in the 9th lunar month. Basho had finished his trip "Sarashina Kiko" and is now back in Edo in his own home.
. atama kara futon kabureba namako kana . Too long for the quilt! At a village in Suma. I sleep all alone . . .
Buson was thinking of the Poet Ransetsu. It was quite common to share a futon with another person, especially on a cold winter night, to keep warm. are used to sit on in the Japanese style, kneeling in seiza 正座. A rather luxury item for rich homes and expensive restaurants. It feels cool to sit on a leather cushion in summer. Even if the edges are rubbed off from long use, they are still cherished. Often uses outside on the veranda or for the tea ceremony. It is used to sit on, not to kneel in Japanses seiza style. They are made from strong Japanese washi paper and soaked in kakishibu extract to make them stronger and resistant to lice. 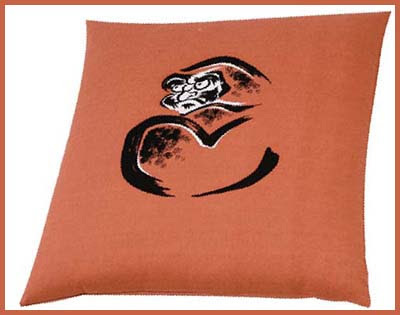 They can be used on tatami to keep the mats clean and hygienic. Nowadays often vinyl is used instead. yuton 油団 (ゆとん) "oil cushion"
They are made from strong Japanese washi paper and soaked in oil or covered with laquer. They feel very cool to the touch in summer.